When it comes to management and leadership, I truly believe that the most important question companies will have to consider revolves around how to ignite “intrinsic” motivations to drive their co-workers passion and willingness to innovate in order to thrive in a fast-changing world. 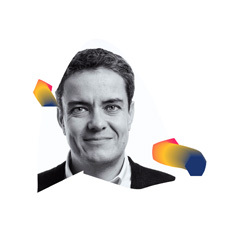 Daniel Pink gathered a thorough compendium of academic studies on this same topic in his book Drive: The surprising truth about what really motivates us, showing how researchers, over the last 40 years, have been demonstrating that above a certain level of salary, more money does nothing to make us walk the extra mile. Even so, companies continue to offer more money and other extrinsic rewards in order to attract and retain their employees. Pink puts forward a 3 axes framework to guide companies in this journey: establish a compelling purpose, encourage autonomy and foster professional (and personal) development. At Good Rebels, we believe in a powerful source of motivation, one which echoes Pink’s third point, that is, working with astounding colleagues who help each other to excel. And, obsessed as we are with the idea of human-centred organisations, what feeling can define humanity better than love? Love has been a source of happiness and one of the pillars upon which social contracts have been built. Yet, love is not expected in the workplace. It was reading Gary Hamel’s 2011 book What Matters Now, that this sad reality dawned on me for the very first time. Corporate issues are hard: markets, products, profitability, promotions, productivity… and yet we are in a time that so desperately needs soft concepts. Traditional values such as family and religion have fallen out of favour in Western societies. More than ever, we need affection and recognition. We’re bored of always talking about productivity, competitiveness, efficacy, positioning and differential advantages. No surprise it’s so hard to come back from holiday. We want more feeling, fun and affection. We want more love during our working hours. Though we’ve managed to create a partnership and bring in (and appoint) non-family partners to work with us, our company was founded by two families and this might be the reason why love is so present in our culture. 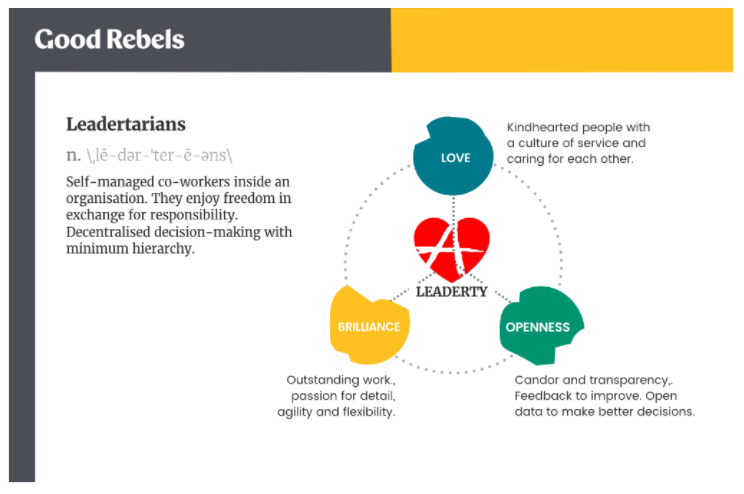 We coined the term leadertarians to describe our co-workers, and we even wrote a book to explain in detail our leadership beliefs (you can download the book here for free in English, or buy it here in Spanish). To represent the concept of “leaderty”, the book cover depicts an anarchist A with a surrounding heart. When we recently picked three values to underpin this idea, Love was the most prominent, as you can see in the figure below. Following the triangular theory of love, developed by psychologist Robert Stemberg, we could base our definition of love on three components: passion, associated with physical arousal or emotional stimulation; intimacy, as something of a personal nature and familiarity; and commitment, a conscious decision to stick with one another or working very hard to do or support something. Though some authors consider love at work to be “companionate love” (intimacy and commitment without passion), we prefer to stick to another definition of passion: a strong feeling of enthusiasm or excitement for something. Deconstructed into these 3 components, who could deny that love is a must have ingredient for a team to succeed? Why bog us down with such an airy-fairy concept? Love at work may not be a popular topic, but there’s been some growing interest as of late. In their 2014 study, What’s Love Got to Do With It? A Longitudinal Study of the Culture of Companionate Love and Employee and Client Outcomes in a Long-term Care Setting, Sigal Barsade and Olivia O’Neill demonstrate how love positively relates to employee satisfaction and teamwork, and negatively to absenteeism and emotional exhaustion. In one hospital, they found a positive association between a culture of companionate love and client outcome, specifically, better patient mood, quality of life, satisfaction, and fewer trips to the emergency room. Collaboration. Teamwork is more important than ever; new disciplines keep emerging and specialities are becoming increasingly niche. Furthermore, servant leadership, not hierarchy nor imposed authority, is on the rise. Empathy, a service mindset and love are weapons of mass construction. Candour. Frank feedback results in brilliant work, particularly when it concerns team creativity and wicked problem-solving. Though we know true love never runs smooth, caring companions can make the act of giving candid feedback a little less rocky. Harmony. How well are our principles and ‘leitmotivs’ aligned with one another? We mustn’t separate harmony from “relevance” (as freedom from responsibility). Being relevant requires hard work and high levels of pressure. Harmony compensates for this excess of stress so it doesn’t stifle emotion. Love supports harmony at work. Historically, organisations have always been places where people showed up wearing a mask (…) People often feel they have to shut out part of who they are when they dress for work in the morning (…) They require us to show a masculine resolve, to display determination and strength, and to hide doubts and vulnerability. According to Laloux, teal organisations let their people “bring all of who they are to work” – including the “emotional, intuitive and spiritual parts of ourselves.” This “desired state” is visibly connected with the idea of love. Though not massively covered by management gurus the idea of love (under this or other names) is much more commonly discussed than we might realise. John Mackey, founder of Whole Foods Market, dedicates an entire chapter in his book “Conscious Capitalism” to this topic. Bob Chapman, founder of Barry-Wehmiller, author of Everybody matters: The extraordinary power of caring for your people as family, said this during an interview with Forbes: “We didn’t start by trying to create a family experience. We simply felt a tremendous responsibility to offer people meaningful work that allowed them to be fulfilled. Part of doing so meant caring for them….listening to them, being respectful of their ideas and unique perspectives, letting them have the freedom to improve their roles, making them realise what they do and who they are matter.” Southwest Airlines is famous for its “lead with care” mantra. As an example, supervisors are trained to be especially aware of the feelings of their subordinates when communicating results of performance reviews. Two of the most-used hashtags at Good Rebels on internal and external social platforms are #RebelLove and #RebelPride. When we were set on promoting “official” drinks (Rebel Cañas, Beers, Chelas or Polas depending on the country) at the end of the occasional work day, we knew it wouldn’t take long to organise autonomously. Birthdays are celebrated with unprecedented euphoria and involve true culinary homage in the kitchen, collective gift-giving and cake. There are Rebel Parties in the summer and winter (the latter includes a Secret Santa). An embrace is more common than a PowerPoint presentation. Meals for Rebel farewells bring everyone together. And when the paramedics had to take an intern to the emergency room, her colleagues offered up an outpouring of affection and several people (including the general manager) went to the hospital to visit her. I suddenly started getting welcome mentions on Twitter, I didn’t know what was going on: “How can everyone know me when I still haven’t started yet?” I couldn’t sleep, on a day when I needed to the most. I got to the office with butterflies in my stomach and saw, in slow motion, how everyone got up to greet me and give me a kiss on the cheek… And when I thought it was all over, we started with the next phase: another round of kisses and welcomes. Where else does this happen? I had been an intern, forgotten somewhere in a company, with no kisses, no name, no nothing. And then there’s a group of Rebels who eat lunch with you on your very first day! […] And training, training and more training; over the first few days, an entire world of knowledge opens up and you think, “Never in my life will I be able to take all of this in.” Yes, you will. There’s patience, a lot of help, and bit by bit, you learn from Rebels how to be a Good Rebel. We like what we do so much that we set a window of time aside just to laugh for a bit, and then double down in our efforts working on our daily tasks. Passion, engagement and fun in the workplace are intangible. Collaboration, camaraderie, co-creation, understanding…will then come to increase sales, profitability and market share. Much of the cold data defending ROI from using social tools in corporate settings are lacking the excitement felt when technology facilitates personal connections, shared experiences and a feeling of belonging. Excitement pays, even if it’s not easy to calculate the ROI. Maintaining the balance between love and peer-to-peer pressure is no easy task. High performers can become impatient with slower movers. New hires could misinterpret care as slack. Secondly, cultural differences greatly affect how outer expressions of love are perceived; physical proximity, hugs or kisses are not used analogously in different countries. Passion has different faces in different places. “Anything that can be measured can be improved,” said Peter Drucker. But when we set an objective and measure its progress, we run the risk of hitting that goal and nothing more, leaving real-life nuances by the wayside. We could, for instance, increase sales, but lose customer loyalty or service quality. Not everything can be easily measured; love, excitement, emotion, the desire to go to work in the morning…I hope we’ve convinced you that it’s time now to start giving out more hugs and practicing sincere concern for our colleagues, their worries and their personal life. Though we certainly need software, we are, more than ever, in need of some soulware.